Custom shark shaped bottle opener key chain with carabineer acts as a real shark by keeping your competitors at bay with its unique design and functionality profile. 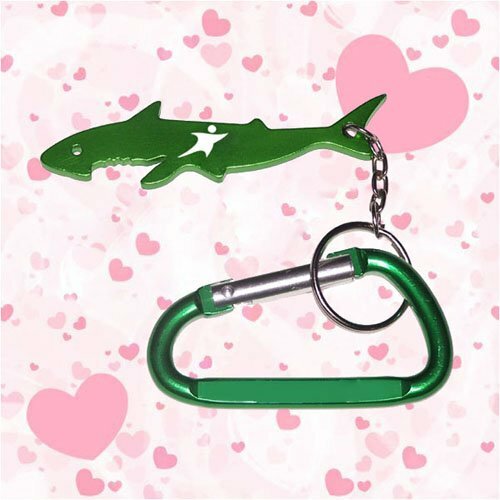 This shark easily helps you to register impressions with its stellar design, and utility as a key chain and bottle opener. You can mark a shark splash by gifting this keychain during next company outing, picnic or a tradeshow. The party-loving customers have added reason to smile by using this multipurpose token and they will take your brand wherever they go. Request a quote to know bulk order discounts on wholesale shark shape keychain bottle with carabiner. Features – Shark shaped aluminum body in metallic finish. Available product colors - Metallic Blue, Metallic Black, Metallic Green, Metallic Red, Metallic Purple and Metallic Silver . Product Size – 3 1/8" x 3/4"
Imprint Size - 1 1/2" x 1/4", 1 1/2" x 5/32"
Product Size :3 3/32" x 25/32"